The red sweater has survived yet another round through the laundry. Yesterday when I pulled it out, still warm from the dryer, more threads had unraveled from the buttonholes. Even though I cull through the items in my closet, discarding things I've not worn in awhile, I have a feeling this red sweater will remain with me till the end. Nine years ago both of my parents were diagnosed with Alzheimer's on the same day. My sister and I moved them out of the home in which they'd amassed heaps of everything that would not biodegrade throughout a 60-year marriage. My sister lived 1,000 miles away, so I handled the bulk of the clean-out. Things were lost. Important things were lost. Four years passed during which my sister and I moved our parents three more times, eventually to the small room they shared in a locked memory care unit, where Mom died. As we cleaned out her remaining handful of clothes, shoes and toiletries, most of her belongings ended up in the Goodwill bag. But, I lingered over the red sweater and offered it to my sister. She said I should keep it because I often wore red. I laid it beside my purse, later carried it to the car, took it home, and hung it in my own closet. It's a classic cable cardigan, store bought, not handmade, true red, my favorite color. Mom dressed me in red as a little girl. Red took on the meaning of hearts, warmth, and love. I have a vague remembrance of a picture in which this same sweater was worn by my mother's mother. Maybe Mom gave it to Grandma as a gift. Possibly Mom rescued the sweater from her mother's closet during a final clean-out, just as I have done a generation later. Probably I'm imagining that scenario. My sister and I wore red to Mom's funeral. We dressed Dad in an old red sport coat, pretty flashy for a 90-year-old man, but red was their favorite color. One year later when Dad died, I was looking through my closet for something to wear to his funeral when I spotted the red sweater. 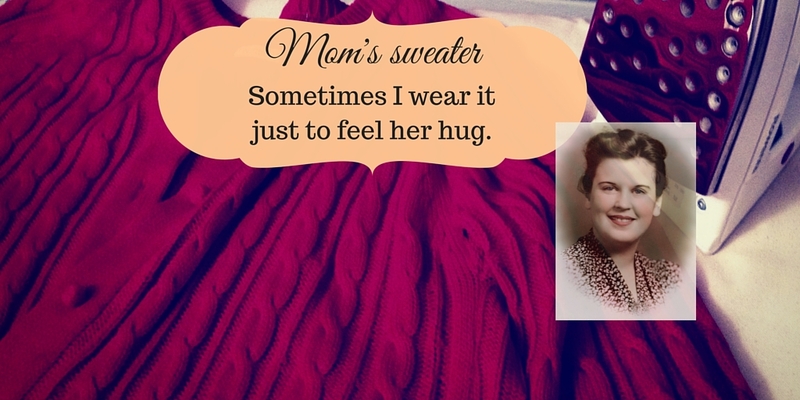 It's probably not typical for a daughter to wear something worn out and a couple of sizes too big to her father's funeral, but maybe Mom spoke to me, saying "Take me to the funeral ... wear my sweater." I'm certain Mom talked with me at other times during Dad's last year. I write about one incident near the end of my memoir, Alzheimer's Daughter. Anxiety loomed as I'd anticipate visits and conversations with my father. Even though I sat beside Dad's living five-foot-seven, 140 pound, stooped frame, I was gripped by stabbing pain at the loss of him. Mom was dead, but Dad was gone. While I talked to this man who couldn't remember sixty-six years of marriage to my mother, and didn't know me any longer as his daughter, I stuffed down my emotion and explained Mom's death to him as though I was reading a children's story to a four-year-old. During one visit, Dad asked, "What happened to that woman I admired?" "Ibby died and went to heaven," I responded. "Oh," he moaned, hanging his head, "No wonder I can't find her." I began to let Mom help me when I visited Dad. I felt her spirit standing behind me, guiding me with the fingertips of her open hands on my shoulder blades, at the same time supporting me so I wouldn't fall. I pictured a cloud of angels, Dad's deceased loved ones, surrounding him -- waiting for him. As I entered the unit and saw and heard others moaning and dying, I imagined a cloud of angels waiting for them as well. Visits took on sacredness. I envisioned the caregivers doing this difficult work surrounded by the hovering spirits of loved ones who waited on the other side of eternal life's invisible door. If this red sweater had been thrown out in any of the clean-outs from my parents' moves, I doubt I'd think, Hmmm, I wish I'd kept that red sweater. In fact, I probably wouldn't even remember it. The details of the sorting are now a blur, with only the memory of the panic remaining. But since it is one of the few things that did survive, I repair and re-wear the red sweater now and then. When I slip my arms into its softness and fasten the buttons (except for the missing one at the bottom) I feel a hug from my mom and maybe my grandma, too.